Penguins in the snow. Christchurch Star Archive. In copyright. CCL-StarP-02829A. 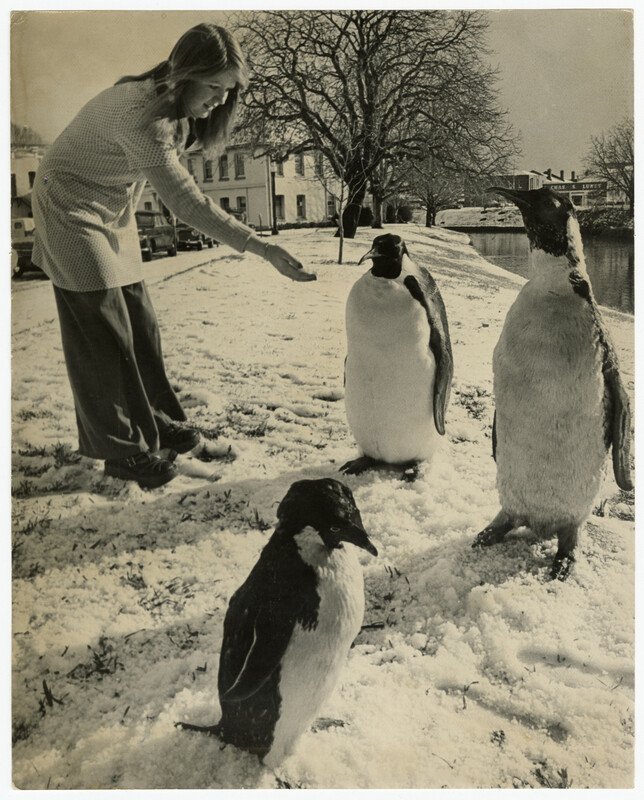 Kim Collier with taxidermied penguins on the Avon River bank in the snow. 21 June 1976. The penguins were usually on display at the Antarctic Division of the Department of Scientific and Industrial Research (DSIR) where Kim worked. When the DSIR was disestablished in 1992 the Antarctic Division became the New Zealand Antarctic Programme (NZAP). This would later evolve into Antarctica New Zealand. Do you have any photographs relating to the Antarctic Division of the Department of Scientific and Industrial Research?If so, feel free to contribute to our collection.